Baltimore’s #1 source for authentic Hip-Hop and culture! 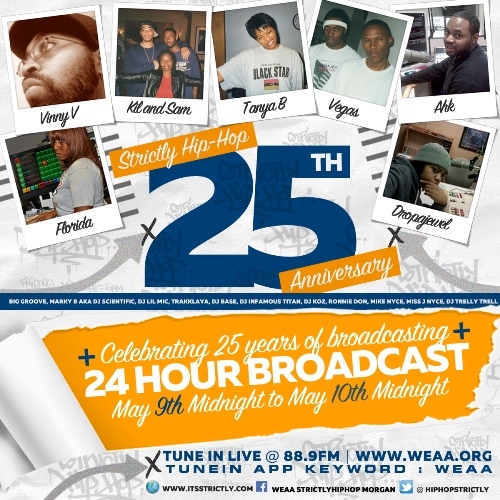 Celebrating twenty-five years on the air, Strictly Hip-Hop will broadcast live for twenty-four hours on WEAA 88.9 FM beginning at midnight on May 9, 2015. Throughout the day various Strictly hosts and DJ’s will provide the dialogue and music for the celebration festivities. Specialsegments will be aired discussing the growth of the Hip-Hop culture and how Strictly Hip-Hop has been an influence on the music scene within Baltimore city and the campus of Morgan State University since it was created in April 1990.